Last night was the opening of the Aesthetica Art Prize 2019 which has hosted at the York Art Gallery. It was a vibrant and stimulating evening showcasing the cream of contemporary art, the ones to watch, so to speak. There was a bold mixture of video, photography and kinetic work and a real sense of excitment about the contemporary art scene. I am immensely proud to be part of this high calibre award with a longlisting for Empyrean, the culmination of my residency, Sculpting with Light in Durham in 2017. It was an intensive and stimulating process to work collaboratively with Prof Giles Gasper to produce a representation of the expansion of medieval cosmos, in a single static work. This is the second year I have secured a longlisting, with Phi having caught the judges eye for the 2016 award. Now I am back in Durham for a new residency, working with the elements and alchemy and I hope to have something for next year that might give me a chance of making this a hat trick. I’ll keep you posted on developments but in the meantime I shall be basking in the glow of being in such talented company. I am absolutely thrilled to be in Durham once more for another very exciting residency. This time I am based at the very friendly and community spirited Josephine Butler College, living and working on campus. The theme of the residency is collaboration and with such eager and engaged students there is no shortage of opportunities. The project I’ll be working on during the residency is called Axis Mundi which focuses on the connection between the earth and the higher realms, in conjunction with the four cardinal directions of north, south, east and west. The elements, alchemy, sacred geometry and astronomy will be woven into this project, with the main focus on how humans relate to and move through the world around us from a physical, philosophical and spiritual perspective. I will be collaborating with Lee McKenzie, the writer in residence, who is exploring digital mapping as the starting point for creative writing and poetry. We will be working together on some multiple perspective video portraits and some experimental performance installations. You can find more information on our joint exploits and be kept up to date with events here. Initial plans for the residency include time lapse, long exposure and astrophotography in addition to landscape art and installations. For three years now, I have been working in Collaboration with the Ordered Universe project. Together we have explored the themes of light, colour, sound and the order of the cosmos from a medieval perspective. During my time with them I’ve had an enormously productive time producing light installations, sculptures and drawings. I’ve also given countless talks at Durham University, Oxford University and MIT, places I thought I’d never find myself. This year we have started 2019 with a bang by presenting our work across the pond. 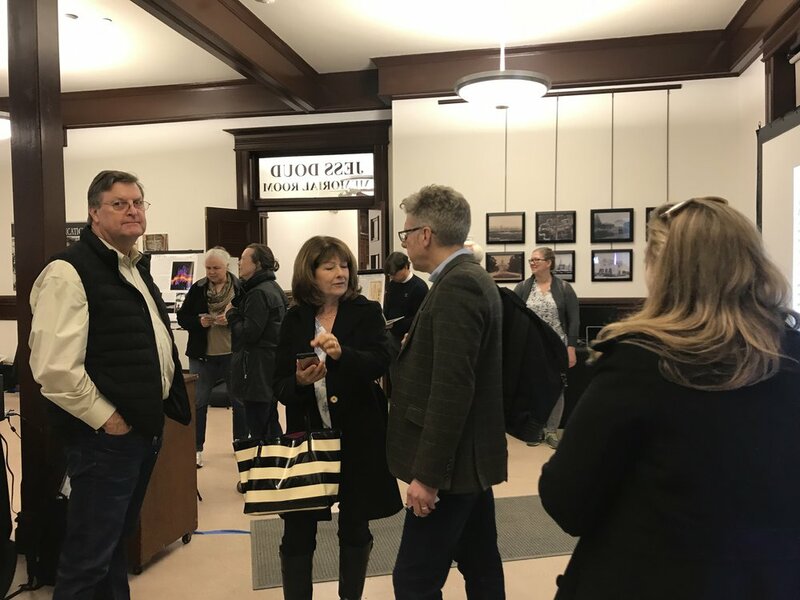 Ross Ashton and Karen Monoid (The Projection Studio), who are part of the OU team, have been helping the Napa Lighted Festival take their vision to a whole new level and invited us to give presentations and a taste of what artistic output via a medieval bishop looks like. Above: Astounding light piece HORIZON by Ross Ashton and Karen Monoid. The programme of talks was varied to say the least, showing just how diverse the artistic stand of the project is. The team were in California early enough to soak up the Berkely atmosphere and catch a paper by Joshua Harvey and Giles Gasper. They spoke about the generation of sound and how that relates to the written vowels. The Napa Lighted Symposia kicked off with a very illuminating talk from Cate Watkinson and Giles Gasper about the history of stained glass and how it has changed over time. Colin Rennie and Brian Tanner presented Beyond the Visible, a collaborative project exploring the limits of our vision through the use of hot uranium glass and uv light. It was an eye-opening talk, featuring wave demonstrations via slinkies, milk and lasers. Andy Hook (of Blackfriars restaurant in Newcastle) and Giles Gasper took us on a journey of medieval taste with demonstrations at the CIA (Culinary Institute of America). Luke Fidler surprised everyone when he told us that cinema is a medieval invention in his talk about Avant Garde film. Joshua Harvey covered human colour vision, metamers and colour perception in our joint talk, Beyond Colour in which I perplexed the audience by stating that purple doesn’t exist as well as presenting my theory of the superposition of colour and its dimension in space. I also brought along a small kinetic light piece that is part of a series of light installations I am working on. Above you can see some of the light effects from the tests. More photos and videos of the piece to come so watch this space. I once again found myself in the north a few weeks back, in the majestic Durham. I spent six months living at working at the old seminary of Ushaw College for my Leverhulme funded residency Sculpting with Light. It was the birth place, both conceptually and practically of Empyrean. After a fairly significant time at Palace Green Library, and a brief rest period in the art vaults of Durham University, it is now time for the piece to be on show at the very place where it all began. The Ordered Universe team recently gathered once again at the National Glass Centre for a workshop focused on the text De impressionibus elementorum (The Impression of the Elements) by Bishop Robert Grosseteste c.1170 - 1253. The Elements text describes just that, Earth, Air, Fire and Water make up the medieval world and Grosseteste puts forward how everything we see in the world around us is a mixture of these elements. The focus of the workshop was a nod to Grosseteste's description of bubbles and we saw them take shape in many forms throughout the day. We began with with a reading of the text and our individual interpretations before moving to the hotshop for glassblowing demonstrations and a bubble inspired piece by Colin Rennie. After the temperature was really ramped up we cooled off over lunch and then enjoyed a presentation from Joshua Harvey about his recent work on medieval imitation gold. Dr Ed Llewellin and Dr Fabian Wadsworth then showed us some volcanic rock samples and gave us demonstrations on how the fluid dynamics of lava flow are dictated by the movement of bubbles. We all had great fun trying to get bubbles of maple syrup to overtake each other! Then back to the hotshop for some more demos and for everyone to get their hands dirty making bubbly paperweights and expressive pyrographs (pouring hot glass onto dampened paper). A very informative and enjoyable day was had by all and we eagerly await the next stage of what is sure to be a very creative response to The Elements. Thanks to Cate Watkinson, Colin Rennie, Claire Todd and Giles Gasper for such a great day. Next wednesday I will be taking part in the Flux Event which is centred around the theme of Site-Specific Art. This was a term that came to prominence in the 1960s when artists were becoming increasingly aware of the physical contexts of their work changing the works meaning. 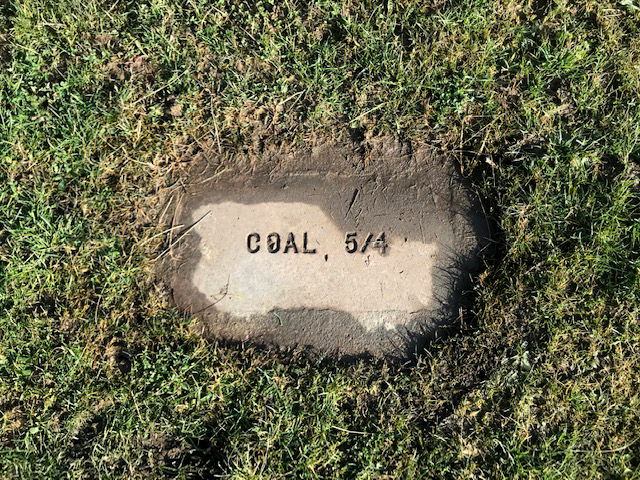 A Site-Specific artwork is a piece where the physical location and surroundings of an artwork are inseparable from its identity. Following a recent trip I took to MIT to deliver a paper with Joshua Harvey, I attended a seminar at Oxford University, hosted by Joshua. It was a chance to hear more about the work of Dr Andreas Merchin, whom we met at the MediaLab at MIT. Earlier this month myself and Joshua Harvey (Oxford University) gave papers at the Media Lab at MIT, Cambridge Massachusetts. Joshua’s paper was titled Medieval and Modern Visual Alchemy: Material and Digital ‘Transmutation’ of Chromatic Statistics, in which he presented his recent work regarding the potential of manipulating distributions of chromatic statistics within an image, to transfer material appearances. His research has significant potential applications in the fields of image processing and computer graphics and has been informed by his investigations into the medieval imitation gold material featured in polychrome sculpture. My paper, The Body of Colour: A Medieval Perspective, outlined my artistic outputs of my collaboration with the Ordered Universe project so far, with a particular focus on colour. Setting aside the current rationalistic empirical paradigm, I proposed the notion of colour as a physical body by investigating the phenomena of light and the concept of darkness. Seeing the world through the eyes of a natural philosopher allows space for the psychological, metaphysical and philosophical implications of the theory of colour, which has led to new scientific theories. The artistic investigation, thoughts and outputs of medieval treatises demonstrates that a revisiting of ideas from antiquity and an uninhibited re-questioning of phenomena is conducive to new methodologies and theories. The talks provided a great opportunity for further lines of investigation both practically and philosophically, with colour perception and impossible colours taking centre stage. Dr Andreas Mershin of The Centre for Bits and Atoms very kindly showed everyone around the lab, wowed everyone with a laser capable of allowing you to see colours you have never seen before, and described the work he is carrying out on olfactory and visual perception. We all plan to meet shortly to continue sharing ideas and keeping the dialogue going. We owe a big thanks to Dr Niccolo Pescetelli for inviting us to speak. We also had time to take in the sites and get a flavour of Cambridge. Below are a selection of videos of work by Arthur Ganson, from his Gestural Engineering show at the MIT Museum, as well as some work from the Museum of Fine Art in Boston. We were truly mesmerised by the scultpures and highly recommend a visit to both museums if you ever get the chance. Having recently been asked to produce an installation with short notice in a very quick time frame I have come to enjoy the spontaneity of such an approach. I produced Ether in Oxford quite recently and found that working in such a fast thinking, instinctive way really refreshing, forcing me to make quick decisions and work within the confines of the materials at hand. I was keen to repeat the experiment and as my friend and colleague, Rosie Reed Gold was due to visit me, I asked her if she was up to the challenge. With a mixture of trepidation and excitement Rosie agreed and the collaborative experiments began. It's true to say we had our fair share of technical setbacks and equipment induced aches and pains, not to mention many work days that finished well into the early hours. 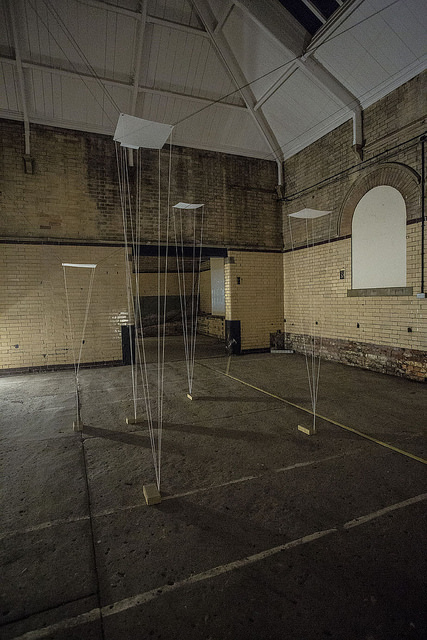 We did however produce Lux Obscura, a collaborative light installation housed in the Mortuary Chapel at Ushaw College. Below is a little snippet of us experimenting with various light effects for video footage. Below is a video of Lux Obscura. For more images and information click here. Ether at Pembroke College, Oxford. Last week I was invited to take part in the Access week at Pembroke College, Oxford. The programme is a week-long, intensive introduction to the academic world for school leavers. The calibre of students and their response was extremely impressive and thought provoking. Dr Peter Claus, who is responsible for establishing the programme and related educational hubs around the country, invited members of the Sculpting with Light team to speak about the developments so far. I gave a talk with Dr Giles Gasper on medieval and modern cosmology, explaining my practice and the developments of the project so far. As an extra challenge, I was invited to install an impromtu sculptural piece in the Chapel. It was a real treat to try out some ideas with a fast paced deadline in a very unusual space. They were keen for me to be daring and I did just that with intentionally limited materials and a very rough concept, proving that limitations can indeed work to our advantage. The above images are the result of the week long installation of 'Ether'. 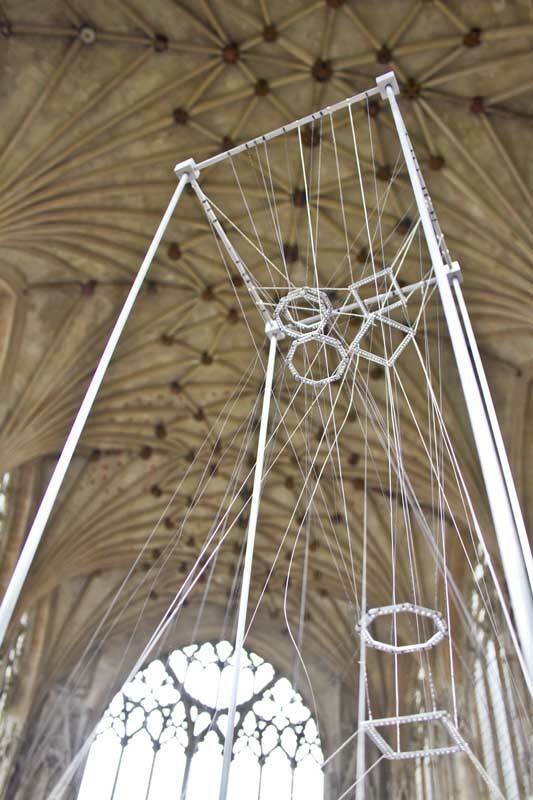 Ether is constructed of 12km of nylon thread which weaves in and around the chapel. The video projected through the piece gives the illusion of an etherial substance floating before you, with the circles of light following you as you move. Some of the Sculpting with Light team took part in the ASMbly Labs at Superposition in Leeds recently. 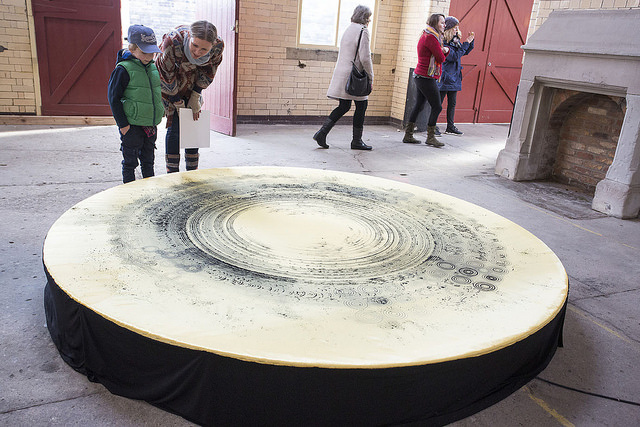 Superposition is a network and space for artists, makers to collaborate. (A)rt, (S)cience, (M)ake labs is Superposition's annual big event. A 12 day long pop-up art science lab with the aim of generating new artworks and prototypes in a fast, hotbed environment of cross-disciplinary collaboration between artists, scientists and makers. They also had workshops, drop-in activities, an exhibition, talks and a closing event with performers working with art, science and making. 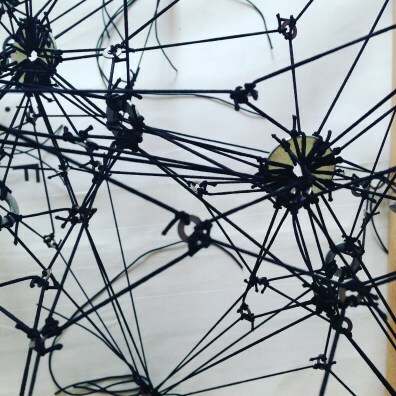 We had the pleasure of talking to Dominic Hopkinson about his geometric sculptural and drawing work that focuses its attention on the irrational number phi, the golden section. This is something I frequently return to time and time again, so it was a lovely opportunity to indulge the mathematics geek in me. The team discussed with the ASMbly crew, the possible ways in which our 'Cosmic Web' maquette may be realised on a monumental scale. 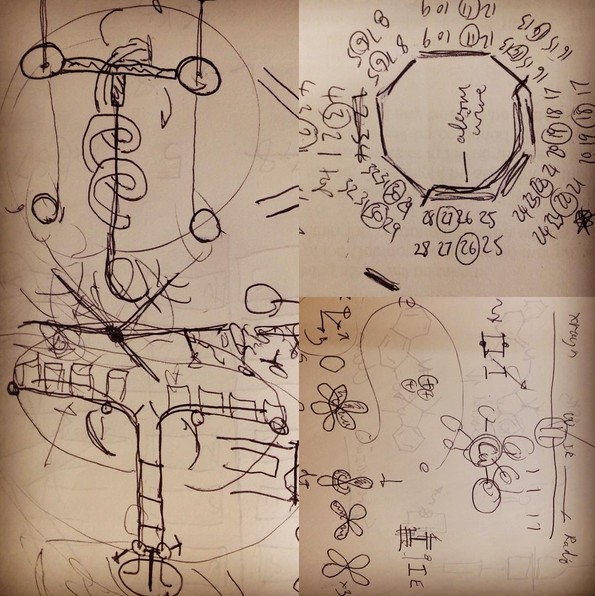 Fluorescent lights, sonic levitation and even drones were some of the ideas on the table. Suffice it to say the 'Cosmic Web' is now in development. The exhibition was impressive, including elegant kinetic sculptures, interactive works that are controlled by breath and even flammable sculptures. 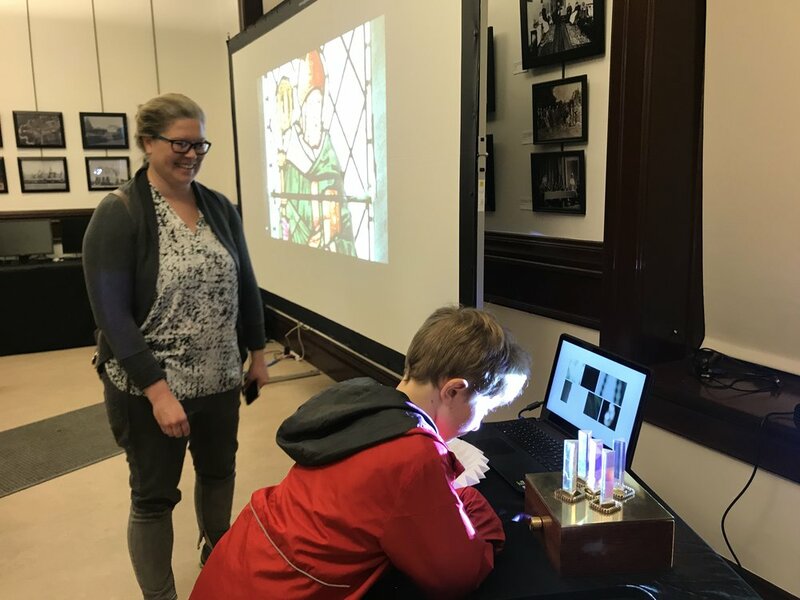 There was even a rare sighting of a medieval historian from the team (Dr Giles Gasper), learning coding to produce interactive light sculptures. So all in all, our brief time at ASMbly Lab was very stimulating and it's definitely got those creative juices flowing. If you can make it to the lab next year we highly recommend it. Here are a few developments from my residency after a great meeting with Professor Richard Bower and Dr Mark Neyrinck. There's been a lot going on in my head and I've been making a few models to try to make sense of them all. I had a great meeting with Richard and Mark last week and they were helping me get a sense of the geometry involved in modern cosmology. So I've been playing with and thinking about structures such as neurons, sponges and non-regular/asymmetric polyhedra. I've been trying to map out in a very organic way, the spatial relationships of galaxies and dark matter, and how best to represent the expansion of space in relation to this complex geometry. From the medieval cosmological perspective I've been focused on the idea of producing expanding and contracting spheres, either literally or the illusion of that motion. Exploring the literal expansion and contraction of spheres, I have been producing spheres of varying 'fidelity', for want of a better word. The idea is that a range of spheres, varying in degrees of perfection, signify the 10 celestial spheres of Grosseteste's time. I am looking to find mechanisms to distort the nesting spheres to their various sizes but feel there is a lot to be gained from looking at elastic structures and the folding mechanisms of origami. 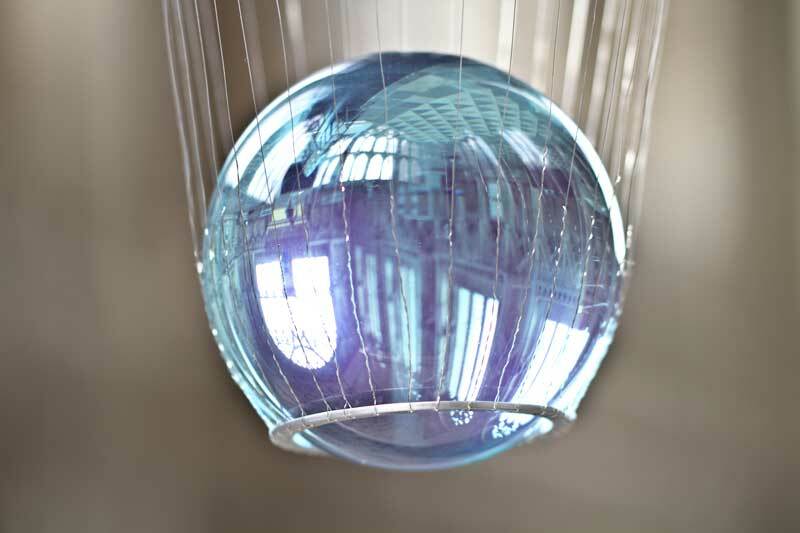 In terms of the illusion of motion of the nesting spheres I aim to do this with the movement of the viewer rather than a traditionally kinetic sculpture. Mark has wowed me with some images of 3D caustic shapes of imaginary galaxy formations which loosely relate to dual polyhedra, which would be great to investigate further and maybe even 3D print as a tool for understanding potential structure of gravity 'folds'. Mark has also introduced me to the Council of Giants, a collection of galaxies that may very well find its way into some 2d wire reliefs. I'm hoping to formally reconcile the nesting spheres with the more chaotic dark matter/galaxy structures. I'm intuitively aware there is a solution but I have a lot more physical models to make before that's clear. I'll be playing around with elastic, paper, plastic and fabric in the coming weeks so it's likely to be a fast and furious collection of ideas to both ditch and nurture. In addition to that I will be doing some work with projection, shadow distortions and light painting. It's been a busy year already with no sign of a creative lull for quite a while. I have recently started my residency, Sculpting with Light, in collaboration with Durham University, supported by the Leverhulme Trust. I have been settling in to my beautiful new home and studio at Ushaw College, with the help of Ushaw College staff, who are always on hand to tell me the history of the place or introduce me to a new gem I haven't yet discovered. I have been busy meeting with my main collaborators, Dr Giles Gasper (history), Professor Richard Bower (computational cosmology) and Professor Tom McLeish (physics). I am working my way through the history of cosmology from Aristotle to Dante and have already begun some geometric explorations. Some subjects being discussed are the expanding and contracting of nesting spheres, the differences between a medieval and modern notion of the void, and modelling an origami universe. Suffice it to say there is a wealth of inspiration already. Well we had a group effort at trying to make a new molecule out of paper, at the Night at the Cathedral, we managed to escape the wrath of the Daleks who have been lurking, but most of all we've had a lot of fun and learned a great deal at the Ely Cathedral Science Festival. Click here for a glimpse of the fun. It is now the final week of the Bodies of Movement show at Ely Cathedral with lots of science related activities still going on. 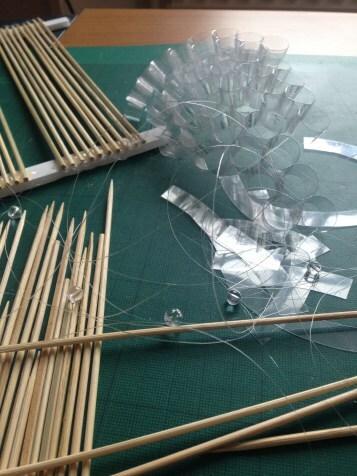 I'll be at the exhibition on the last day of the show, Sunday 18th June, making some models of work in progress. If you would like to pop along to see what I'm up to or have a chat, you are more than welcome. Below is a short video by Rosie Reed Gold showing the making of the exhibition. There is still time to crack the code of the Helix, which is the sculptural centrepiece of the exhibition. We have encoded a word into the Helix using the colours of the squares of fabric. I will be giving away a signed and numbered, limited edition print to one person who can crack the code and submit the correct answer. The winner will be selected at random from the correct answers. If you think you've got what it takes to crack the code, take a tip from Dr Francis Lister..... 'The first letter in the sequence is an unnatural amino acid, so start in the middle and guess the last letter. 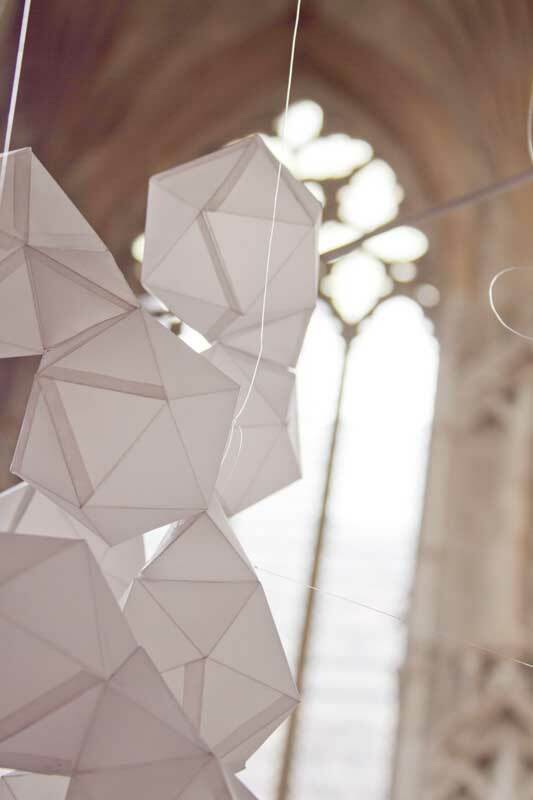 Bodies of Movement is a solo show bringing together the worlds of physics and biology through site specific work and drawings whilst responding to the awe inspiring architecture of Ely Cathedral. Motion, structure, form and scale are at the height of this work. I aim to reconcile the very large and the very small, from single celled organisms to the motion of planetary bodies. The work raises questions about an underlying code that connects all of us to each other. Bodies of Movement is supported by Arts Council England and is part of the Ely Cathedral Science Festival 2017. The exhibition continues until 18th June 2017. I am pleased to announce that 'Phi' has been longlisted for the Aesthetica Art Prize 2016 and a video of the piece will be on show at the exhibition at York Gallery this May. It will also be published in the Aesthetica Art Prize Anthology which showcases the work of 100 leading artists from around the world and is a dynamic guide to international contemporary art. For more information about the sculpture and further images click here. Photography by Rosie Reed Gold. Last autumn I was invited to co-curate and exhibit in a group show at The Old Parcels Office in Scarborough with Caroline Underwood. 'In Transit' is the outcome. After much excitement we opened our doors last Friday night and for the Coastival Festival weekend, to launch the exhibition and this spectacular building as a vibrant new art space. We even had a visit from BBC Radio York who were frantically trying to beat the clock to get to the treasure for their weekly treasure hunt. We were the treasure! If you'd like to listen to the show click here. (20mins 30 seconds in if you want to skip to us). In Transit’ is a group exhibition of established and emerging artists working in a variety of media, from sculpture and painting to projection and installation. 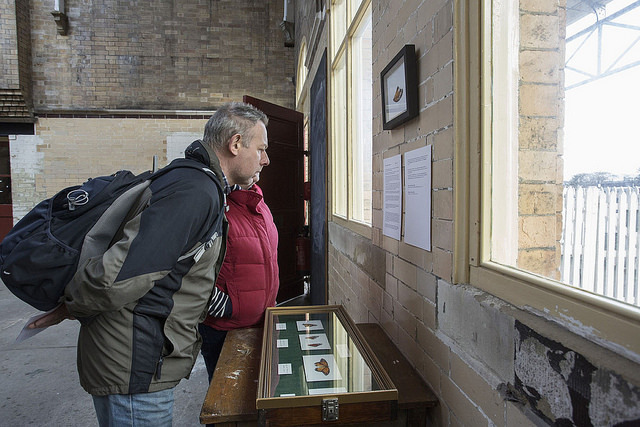 We seek to bring together a variety of styles and approaches to represent the diversity of contemporary art, with artists invited to work as directly or loosely as they wish, in response to the theme and the Old Parcels Office setting. Taking the notions of space and place as its starting point, the exhibition showcases current themes and methodologies in contemporary art and present juxtapositions of static and dynamic installations that aim to challenge and celebrate the bold architecture and space that the unusual Old Parcels Office site provides. In this show I exhibited 'Black Matter' for the first time in the UK. To see more images and a video of the piece please click here. Alexandra Carr, Caroline Lambard, Caroline Underwood, Jennifer Hooper, Owen Bullett, Rosaleigh Harvey-Otway, Rosie Munro Kerr, and Rosie Reed-Gold were the exhibiting artists, each producing a unique limited edition print to accompany the show. You can see the prints here. For sales please contact the individual artists. Above is the Old Parcels Office, a developing artspace in the centre of Scarborough. I was recently commisioned to illustrate an article for Phoxpop magazine, an independant printed publiction consisting of 96 (advertising-free) pages of stories about thinkers, seekers, makers and doers. The Launch event is tomorrow (Thursday 25th August 2016) at 6.30pm, where the final engraved illustration will be on show along with some other enticing displays and a chance to meet the team and raise a glass in celebration of their amazing achievement. It would be great to see you there. Through carefully-crafted words and striking images, Phoxpop tell the stories of ambitious and inspiring people, and their creative and curious pursuits. Inside their pages you will find tales of and by people from fields including art, science, history, exploration and experimentation. They like to think of themselves as a cabinet of curiosities in paper and ink form. I am absolutely thrilled to have recieved this news today. Below is the video entry which managed to catch the eye of some of the judges. I hope you enjoy it. After months of application writing, trouble shooting kinetic pieces, travelling, meetings, missed trains, budgeting and laboriously trudging my way through to do lists I have begun to feel less and less like an artist. I have been yearning to get back in the studio, sketch the ideas that have been niggling at me and touch materials once more. Being in touch with the skills which bring you alive is important. I long to craft crystal forms, carve ice, mould porcelain and chip away at stone. That time is near but today I had confirmation that all my 'non-artistic' efforts have not been in vain. I have been shortlisted out of over 900 applicants for the Arts@CERN COLLIDE International Award. I feel honoured to be part of such a select group of hard working, established and well respected artists. So thank you CERN. I would also like to say a big thank you to all my friends, family and colleagues who pick me up when I'm down and keep me on the right path when I begin to doubt myself. Knowing that what I do touches people makes it all worth while. I've been itching to share this piece with you all and now the time is finally right. The video above is a recording of the live performance from Phillipe Clause which was performed at List í Ljósi light festival, as a result of a collaborative project we worked on together with Laura Tack, which was filmed in Seyðisfjörður during an artist's residency. Last night I had the pleasure of talking to Professor Tom McLeish, Professor of Physics at Durham University, about the importance of play in research and the creative process. The value of rambling investigation and unexpected forks in the road, en route to your destination is, we agreed, a worthwhile undertaking. The notion of letting go of the end goal as soon as it pops into your head is, all too often, is an impossible concept for many, nevertheless, a practice destined to furnish you with unexpected 'gems and nuggets' as Tom puts it. 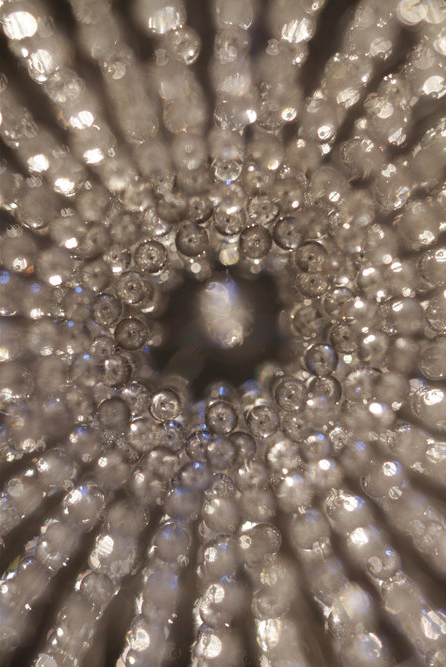 Both art and science seem to those within these fields, to be vastly misunderstood. As a physicist, Tom challenges the notion that it is all experiment, data, hard graft and endurance. Science requires enormous creativity, open mindedness, philosophy and even a metaphysical approach to the questions at hand. Similarly I'm often met with the opinion that all artists simply float on a sea of creativity, effortlessly producing masterpiece after masterpiece, without the need to eat, drink , sleep or pay rent; we simply survive on the ecstacy of creation gifted to us by our muses! Not the case. We too have our experiments and failure after failure after failure. You must devote your lifetime to learning your craft, you must be resilient to rejection, you must commit to the surprising mundanity your practice will throw at you, you must accept the guts and grit it takes to keep going. All sketches and 'play' form part of the investigation of Grosseteste's scientific texts. This is part of a collaboration with The Ordered Universe Project, an interdisciplinary, international collaboration. Despite these misconceptions, art and science have one thing in common, they both ask the vast, sprawling, powerful and essential questions about nature and our relationship to it. They ask the questions bigger than us and this moves us deeply. Given our common goals perhaps it's time for these definitions to blur as they once did in the age of the polymath and the Renaissance Man, when Tom would have been known as a Natural Philosopher rather than a Scientist. It's a term, I would certainly feel comfortable with for myself. The beginning of a framework for a 2D relief piece, born out of 'play'. By accepting the guts and grit in the framework of play you are embarking on a journey of discovery that can be obtained by no other means. So go, be free and soak up your path of illumination and find the Natural Philosopher within.